The aim of this report is to present and discuss the main ethnic, cultural and religious diversity challenges that Europe is facing today. 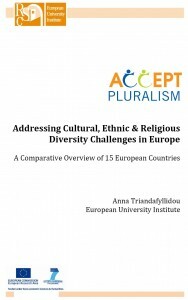 In particular the report surveys 15 European countries, notably 14 member states (Bulgaria, Denmark, France, Germany, Greece, Hungary, Ireland, Italy, the Netherlands, Poland, Romania, Spain, Sweden, and the UK) and one associated country (Turkey) and identifies the minority groups or migrant populations that pose the most important ethnic or religious diversity challenges within them. The report concentrates in particular on challenges that have a currency across several EU countries. It discusses the ways in which different countries have dealt with similar diversity dilemmas and identifies appropriate courses of action for the future. The report is organised into seven parts. In parts 1-6 we offer working definitions, followed by a comparative review of state formation, conceptions of citizenship and national identity, and minority/immigrant groups in the 15 countries studied. We also discuss comparatively the challenges raised by three main minority populations: ‘black’ people, Muslims and Roma (and the policies addressing with these challenges). The seventh section of this report offers 15 short country profiles outlining the situation in each of the countries studied.